Annual conference at the Southwest College of Naturopthic Medicine in Tempe, Arizona. Topics include Thomasonian classics, treating diabetes type II, Ayurveda for women, interstitial cystitis, hormone replacement therapy, autoimmunity, and much more. 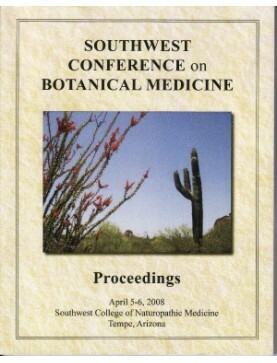 2008 Southwest Conference on Botanical Medicine: Conference Book. Order download of PDF f..
Speaker: Deborah Frances. Discusses the role of herbs in the treatment of urinary tract infections a..
Speaker: Paul Bergner. A review of the actions, therapeutics uses, toxicology, and combinations..
Speaker: Amanda McQuade Crawford. Herbs such as guggul and garlic are frequently used for prevention..
Speaker: Michael Moore. Three herbs: Erioigonum (wild buckwheat), Gossypium (cotton root), and ..
Speaker: David Crow. Traditional systems of phyto-medicine are based on an underlying philosoph..
Speaker: Michael Moore. Focus on common desert plants to boost immunity, as only Michael Moore ..
Speaker: Dharmendra Dube. A description of the more unusual Ayurvedic herbs they use and their ..
Speaker: Paul Bergner. New information on adverse effects the herbalist is likely to see in practice..
Speaker: Cascade Anderson Geller. Based on Cascade's travels in Ecuador, these traditional herbs and..
Speaker: Tori Hudson. A comprehensive understanding of this complex endocrinological disorder i..
Speaker: David Crow. The use of aromatic plants, essential oils, and hydrosols is a branch of A..
Speaker: Dharmendra Dube. The causes of migraines due to an imbalance in the doshas (excess vat..
Speaker: Cascade Anderson Geller. Spend time in the herb garden at the college and learn the healing..
Speaker: David Crow. Besides its role as a major ingredient of perfumery, rose oil has a histor..
Speaker: Sumita Prajapati. Discussion of Ayurvedic treatment for menstrual disorders, menopausa..
Speaker: Deborah Frances. A journey with three nervines: their similarities and their differenc..
Speaker: Tori Hudson. A selective research update on important natural therapies in women's hea..